Once you execute a search, a wide variety of functions are available via right-click menu options on the search results page. To open a file, click it. If you are currently viewing a project or folder, you can select the Search in Project/Folder Name option to restrict the search. Begin typing your query in the Search field. Click the view all search results link to open the Search Results page. If you are currently viewing a project or folder, you can select the Search in ProjectA project is a top-level folder within Autotask Workplace. A project is the primary container for all the folders and files that are synchronized by the Workplace service. 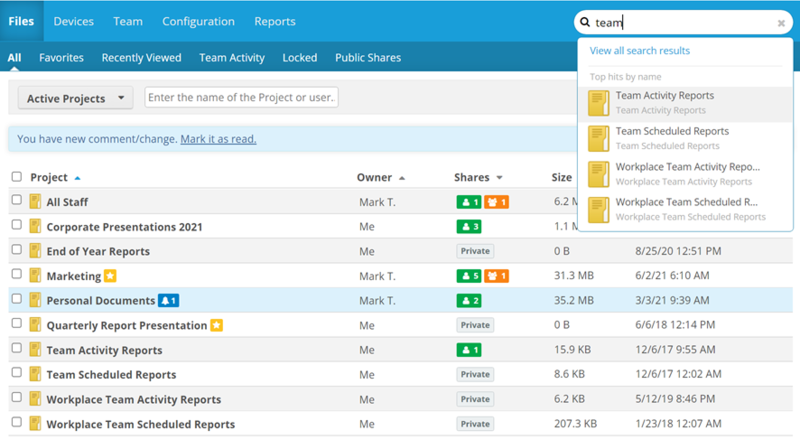 Projects create the basic organizational structure to store data and control user access./Folder Name option to restrict the search. By default, your search query is matched to file names only. If you want to search file contents as well, just select the Search file content check box on the search results. Click a Filter by link to select or enter additional search criteria. The search results for File Type, Changed By, File Size, and most Date filter selections will be applied automatically. If you use the From/To fields in the Date filter, you must click the Filter link at the bottom of the filter entry dropdown to complete the search. These date selections are persistent within this search session, but they will not be applied to your search unless you click the Filter link. Click the icon next to it. Your search results will be refreshed automatically. Hover over an item and click or right-click on a item. Depending on the item type, different menu options will be available. Click an option to execute the function. Select the check boxes associated with the items. A menu will appear as soon as you select one item. As you select more items, the menu options may change.